Mentoring, at its core, guarantees young people that there is someone who cares about them, assures them they are not alone in dealing with day-to-day challenges, and makes them feel like they matter. Research confirms that quality mentoring relationships have powerful positive effects on young people in a variety of personal, academic, and professional situations. Please email ctravers@hfyny.org or call (631)782-6540 for more information. 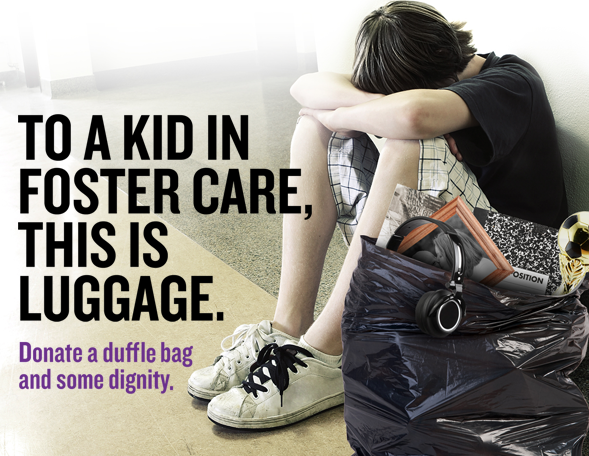 How can a duffle bag help a child in foster care? It’s simple. They won’t have to carry their belongings from place to place in a plastic garbage bag. Maybe they can even hold their heads a little higher. Over 1,300 children on Long Island are in foster care. They will move several times before the age of 21. With each move, their possessions go in a garbage bag — like trash. These children have enough baggage to carry. If you choose to donate (gently used or new), know that 100% of your donation directly benefits kids in foster care on Long Island. Please email ctravers@hfyny.org or call (631)782-6540 for more information.